Writing the next chapter: What story will you tell in 2015? My first post for 2015 is bike-themed, because Tim and I went for a bike ride this morning to kick off the new year. No need to peddle old ideas when you can pedal into the future! There are always endless possibilities for New Year’s Resolutions. Finish your novel. Lose weight. Find The One. Change jobs. Get to Mordor and drop the ring in Mount Doom. The usual. Write a good story with your life. A true hero need only be a person who sets goals and overcomes conflict to achieve them. Last year I wrote my story as well as I could. I had goals, and I overcame obstacles to achieve them. After the usual stresses of preparation, I married the right man for me and enjoyed decorated our new home with the artworks I made with my own hands. I left a job I didn’t enjoy and worked hard at building my editing business so I could continue to do the editing work that I love. 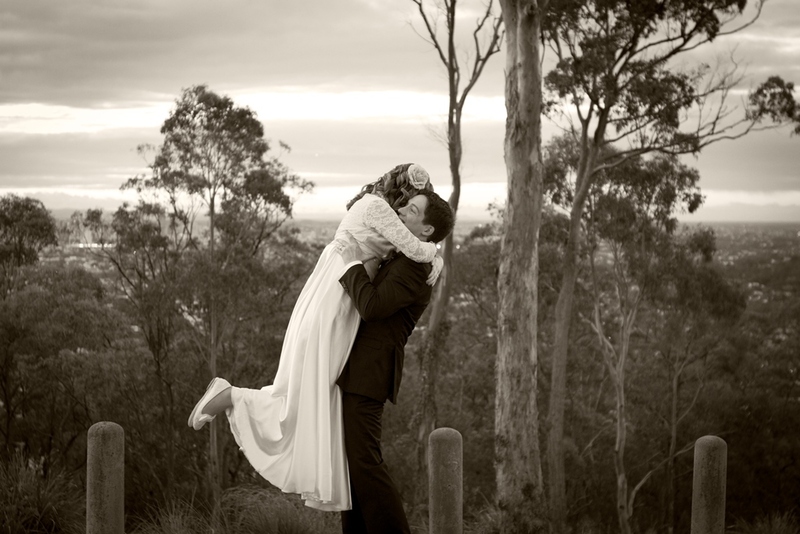 I made time to do some of the adventures I enjoy like bushwalking and beach trips, both with friends and by myself for much-needed and much-appreciated “God dates”. Halfway through the year life got really difficult for a time as I found I had some severe struggles to work through, so I asked for help when I needed it and I trusted God to get me through. I began submitting one novel to publishers, entered as many short story competitions as I could, and completed NaNoWriMo again. And I showered as much love as I could on the people I care about. So here are the few things that I felt went into writing a good story with my life in 2014, and what I’ll be trying to seek out again in 2015. Me and Tim holding hands at the altar. Ever wondered what type of music will help you to focus when writing in different genres? Here’s what’s worked for me in the genres in which I’ve written or edited. Okay, NaNoWriMo is nearly over, with only five days until the end is declared. So if you’re nearly there, here’s some final inspiration, to give you the last push you need to get that baby out (what a gross analogy, seriously). And if you’re boycotting NNWM and you’re kind of sick of hearing about it, soon we’ll be back to awesome posts that are not all about how to write a novel in the shortest possible timeframe. Why does music help you write? Studies have consistently shown that classical, Baroque era music can help students study things they’ve already learnt once, and can help workers to concentrate better during long or repetitive tasks. For those in a busy study or work environment, music has also been proven effective for blocking out distracting background noise. If you’re writing, editing, or creating art, music can help you stay focused and be more creative and open to new ideas. By contrast, if you’re trying to learn new information that requires your full attention, music can distract you from what you’re reading. So if you’re doing research about historical methods of leather tanning for a new book, you might want to turn the stereo off and focus on the history. So what can you use to inspire you when writing in different genres? Read on to find out! TIPS FOR BREAKING THROUGH the writer’s block wall. 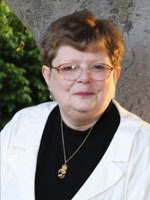 In this great post in ‘NaNoWriMo pep talks’, Tamora Pierce talks about trying two super simple things to get your character moving again. As for Tamora’s credentials, she is one of my favourite authors, and her writing is legitimately incredible! Her characters are believable and her plots are fantastic examples of medieval fantasy written for a younger audience that doesn’t dumb it down. I discovered her when I was ten and I’ve read almost every book she’s ever penned – which is a LOOOOOT of books. On the sidewalk. In a forest. Getting out of a swimming pool. Tripping, no matter when or where it happens, is by nature an unexpected event. Depending on how tired they are, how many resources they have left, it’s something that can make your character overreact completely, do something crazy and uncharacteristic, or make them realise their newfound strength and rise to the challenge. e.g. Whoops, my character broke their leg. Now they can either react by punching in the face the person who tripped them over, or my character can react by using the time off to do something they’ve always wanted to, accomplish a dream. Like painting a beautiful sunset. Or watching a Firefly marathon interrupted. 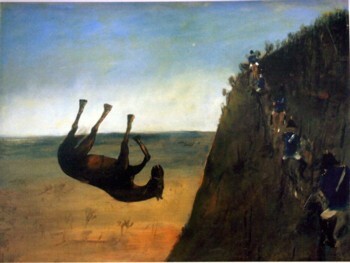 This horse (painted by the odd-but-amazing Sidney Nolan) fell off a cliff, poor fellow. Now that’s a bad day! What’s a memorable time you tripped? Can you work it into your story somehow? This post was written by TJ Withers-Ryan © 2014. Reblogging is highly encouraged as long as you credit me as the author. My previous post was about the Art Gallery Museum and the intriguing characters I uncovered in the old portrait paintings there. 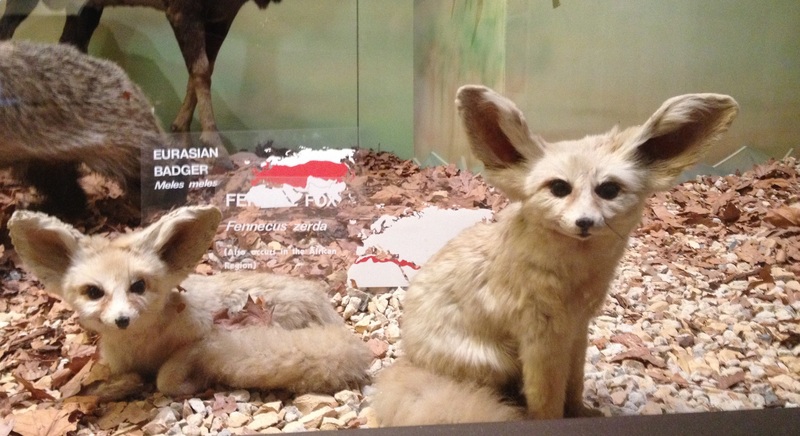 Now let me tell you about the incredible animals I discovered, many for the first time, at the South Australian Museum. Some of these guys really look like they should be in a fantasy or sci-fi novel, not in the real world. For that reason, I found these animals awakened in me again the desire to write fantasy, a genre I’ve spent many years in but often abandon for “more grown-up” genres like science fiction (haha) or drama. 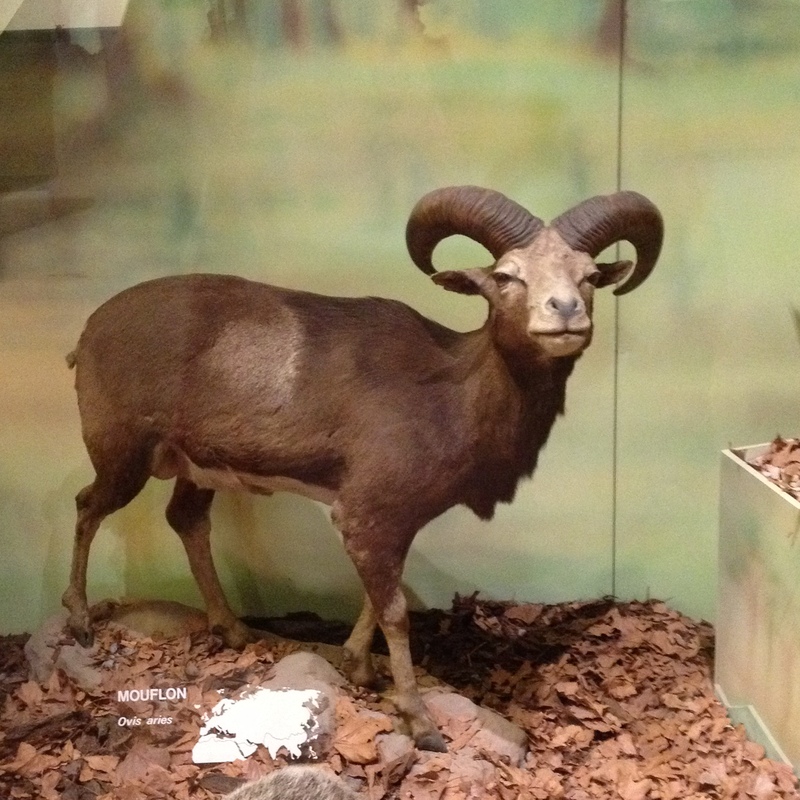 I spent a few hours over three days walking through the ‘Mammals of the World’ taxidermy exhibit, because I just loved it the first day, but there was so much that I just felt I hadn’t taken it all in, needed another hit. I was pacing back and forth behind the glass, getting a bit upset that these gorgeous things were dead, just carcasses posed for my viewing pleasure, and most of the living versions were endangered anyway, when it hit me. I wanted to write fantasy animals based on these real animals. Think about it – if I describe an animal to you just using the description, not labelling it by the name we know it, it would be harder for you to imagine, wouldn’t it? You might even think I was making it up. I’ve been thinking about how kids books can make a difference for disadvantaged people groups. The poor, the oppressed, the marginalised. Those starving in a third world, or held captive by a regime of fundamentalist beliefs, the homeless, the refugees, those who come here not speaking our language. But I don’t think the best way to do it is to directly target those issues. There are many award-winning, real-life dramas for kids that address racism or other forms of prejudice, like the multi-award-winning The Little Refugee, by famous refugee Ahn Do, or The Curious Incident of the Dog in the Night-Time by Mark Haddon, or the more recent The Invisible Hero by Elizabeth Fensham. These are books that many kids read in school; in my day, it was To Kill A Mockingbird for anti-racism, and I Capture the Castle or A Little Princess for accepting poverty. Wonderful as these books all are at persuading their child audience to be more welcoming and accepting of certain people groups, I think they can never be as successful at persuading their child audience to be more welcoming and accepting generally, as stories told through the from-out-of-left-field genres of fantasy and sci-fi. An article yesterday on the topic (this one is from Arts Mic; read its other variations in most other major news outlets, e.g. 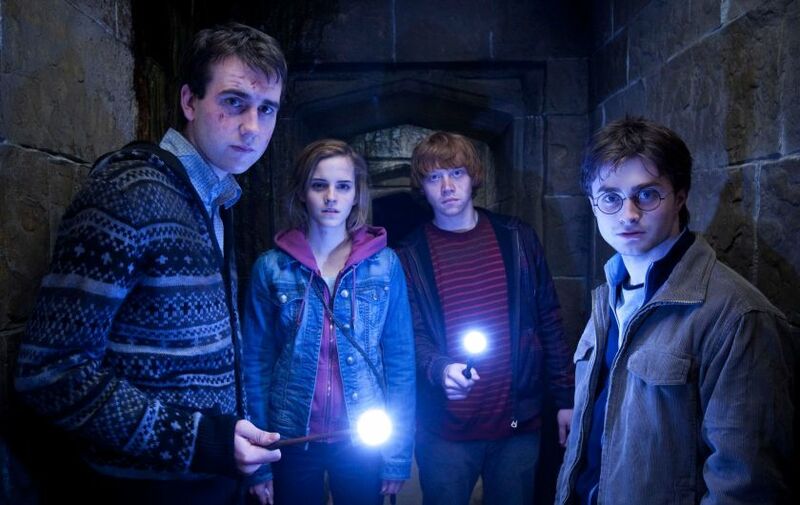 Sydney Morning Herald) discussed a series of three studies of Italian kids who had to read Harry Potter for school. This study showed that kids who identified with Harry Potter had significantly stronger tolerance for minority groups such as refugees, other immigrants, and gay people. The more HP books they had read, the more tolerant they were. And in contrast, kids who identified in any way with Voldemort showed less tolerance for refugees and other minority groups. It’s simple if you think about it. Harry befriends Hermione, a ‘mudblood’ (a Muggle-born witch); Ron, the son of a very poor family; Hagrid, a half-giant ostracised by non-giants and giants alike; and Neville, who due to no fault of his own shows less aptitude for their magical studies. J.K. Rowling said in 2003 that she never set out to teach kids anything, but she did say at the conclusion of the series that she considered it “a prolonged plea for an end to bigotry”. This revolution in kids, started by a fantasy book series, reminded me of a powerful sci-fi movement that changed how we think about minority groups in the Western World. 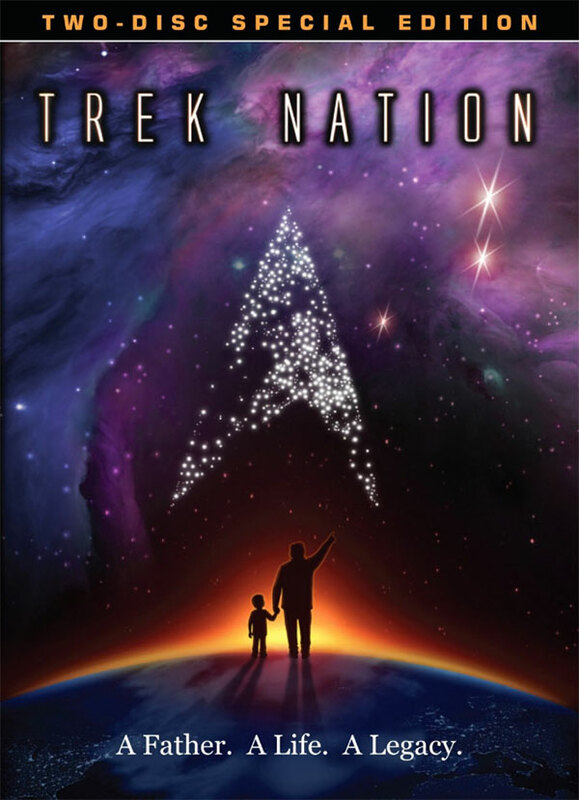 I was recently watching a 2011 documentary by Rod Roddenberry, the son of Eugene Roddenberry, creator of Star Trek: Trek Nation. A lot of the documentary focussed on how Star Trek allowed its viewers to feel like it was okay to be different. No, Star Trek wasn’t written specifically for kids, but a lot of kids watched it. It was clean – very little bad language, violence, or adult themes. And it changed how they grew up. In one powerful line, Rod said the thing that struck me the most: that Star Trek viewers had been consistently shown to be more tolerant people in general. They were more tolerant and accepting towards other races, other genders or sexualities, and other worldviews, better than the average person. Part of the reason for this is because the show was, from the beginning, multicultural in its choice of actors. At a time when there were few non-white or foreign roles in American television dramas (the UK did a little better), Roddenberry chose an African woman to play Uhura, a Scotsman for Scotty, a Japanese-American for Hikaru Sulu, and a half-Vulcan alien for Spock. Do you think books about real-life drama can achieve the same thing in kids through such subtle methods, such subconscious and long-lasting success? On a faith note, Jesus embraced the outsider everywhere he went, and supported multicultural attitudes and interfaith communication whole-heartedly. Then in Luke 9:54, Jesus and the disciples are looking down at a Samaritan village that has rejected the message of Jesus and thrown them out of town. James and John turn to Jesus and say, “Lord, do you want us to call down fire from heaven to destroy them?” But what does Jesus do? It says in verse 55, “But he rebuked them [the disciples].” And this obviously has a huge impact on John, because later, in Acts 8:14, the disciples hear that Samaria has “accepted the word of God”, and as they’re deciding who to send there as missionaries, they choose Peter and John.